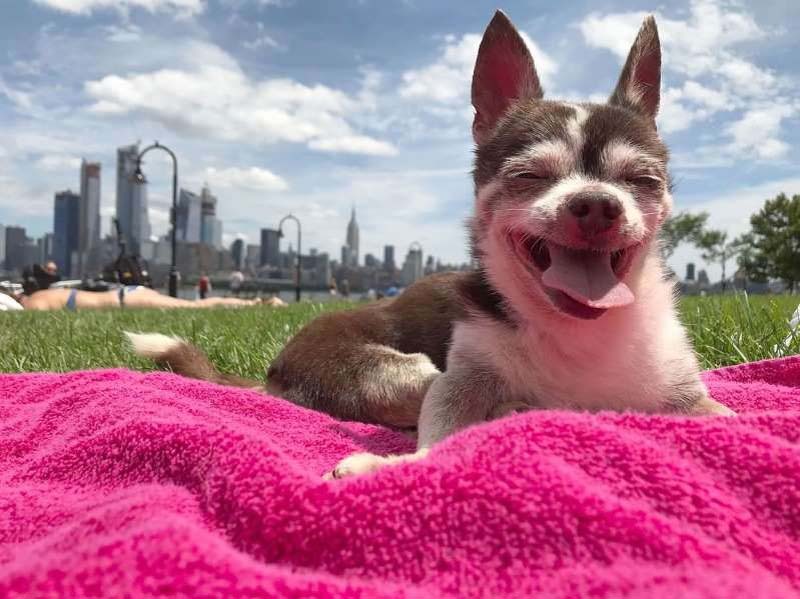 Kristina Helfer, the Adoption Foster Coordinator at Wise Animal Rescue in New Jersey, fell in love with a dog and his medical record. “I saw his little face and plethora of medical records and my heart broke,” Helfer tells PEOPLE about first seeing Tito, a senior Chihuahua who has irreversible nerve damage which prevents him from using his back legs, on an intake form from another animal shelter. The coordinator knew that this canine, homeless again at 15 because his owner had to be hospitalized, needed a loving home and a healing touch. Helfer brought the dog to Wise Animal Rescue and then took Tito home to be his “hospice mom” through the rescue’s Lola’s Legacy program. Lola’s Legacy was created in honor of a dog named Lola with an unbreakable spirit, who was saved from overbreeding and survived under the rescue’s care for 37 days before succumbing to the massive mammary tumors taking over her body. Through Lola’s Legacy, Wise Animal Rescue pays for all the medical care of senior and severely ill animals while they live out the twilight of their lives in a caring, comfortable forever home. Tito is definitely one of these dogs; along with the nerve damage, Tito was suffering from a collapsed trachea and an infected tumor when Helfer first found him. 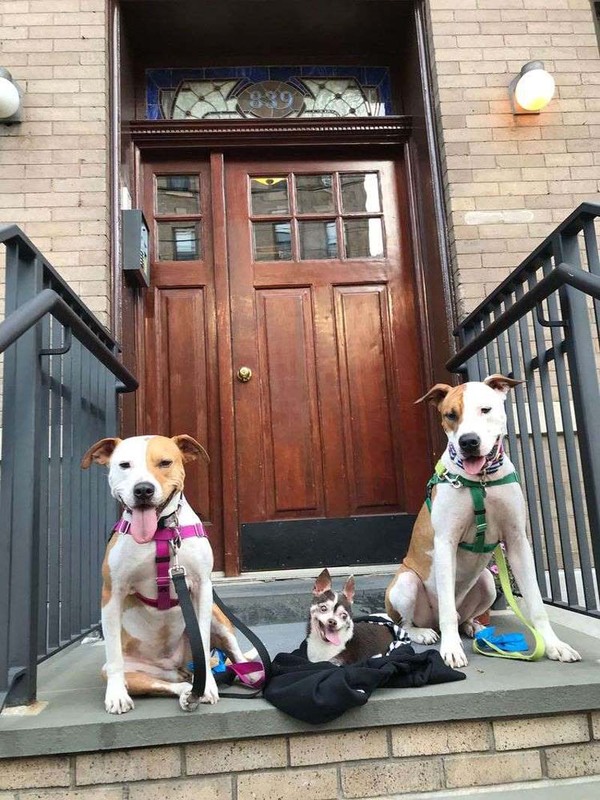 After surviving treatment and surgery, Tito moved into the animal lover’s home, which she shares with two similar-looking pit bull rescue dogs named Frank and Piper, known on Instagram as the @theyinyang_twins. 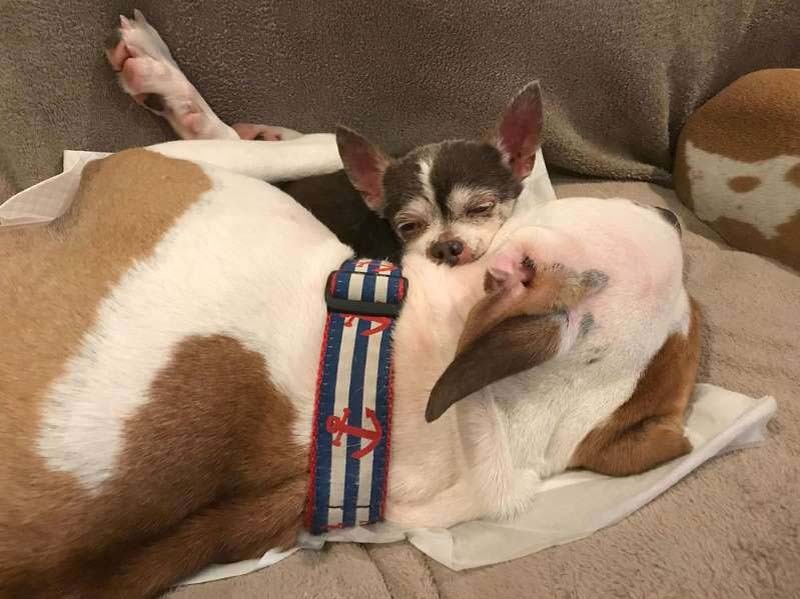 Piper, who has helped Helfer look after dozens of foster pets, happily welcomed Tito into the furry fold, but it was Frank who truly gravitated toward the tiny pup. “He has this weird intuition with dogs that are vulnerable and he takes to them and he is dad, he cares for them,” Helfer says of the pet, whom she also calls Nurse Frank. Even though Tito is only 6 lbs., 70-lb. Frank had no trouble getting on the little dog’s level and providing the senior with the healing friendship he desperately needed. 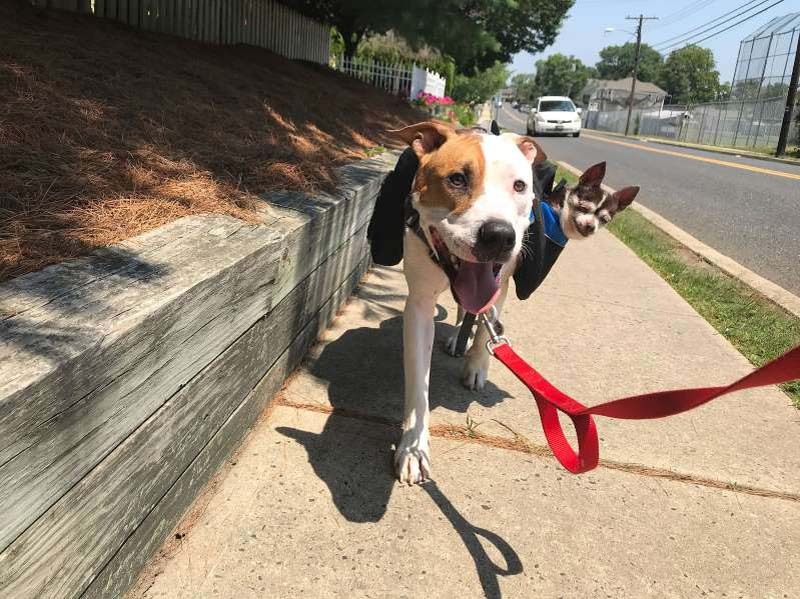 Moments after meeting, the pair became inseparable and can almost always be found snuggling, if they aren’t on walks together. For their regular strolls, Tito, who cannot walk on his own, hangs out in the pocket of Frank’s vest. 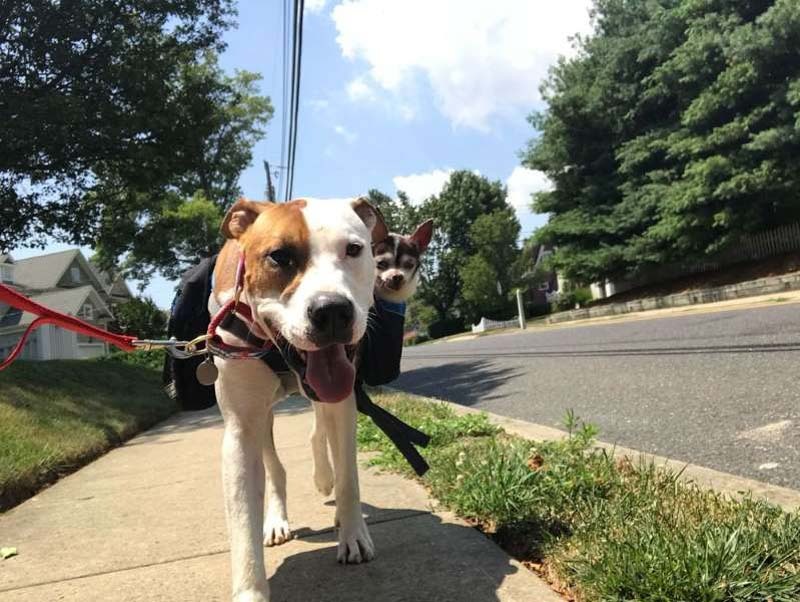 Helfer says that Tito’s happiest moments are on these walks, especially when they stop at an outdoor cafe, where Helfer shares a good part of her lunch with Tito. “We are trying to do all the bucket list items we can think of,” the owner says, adding they have already gone to the beach, gotten ice cream and spent a day on the Jersey Shore. Back at home, Tito and Frank are constantly keeping tabs on each other. 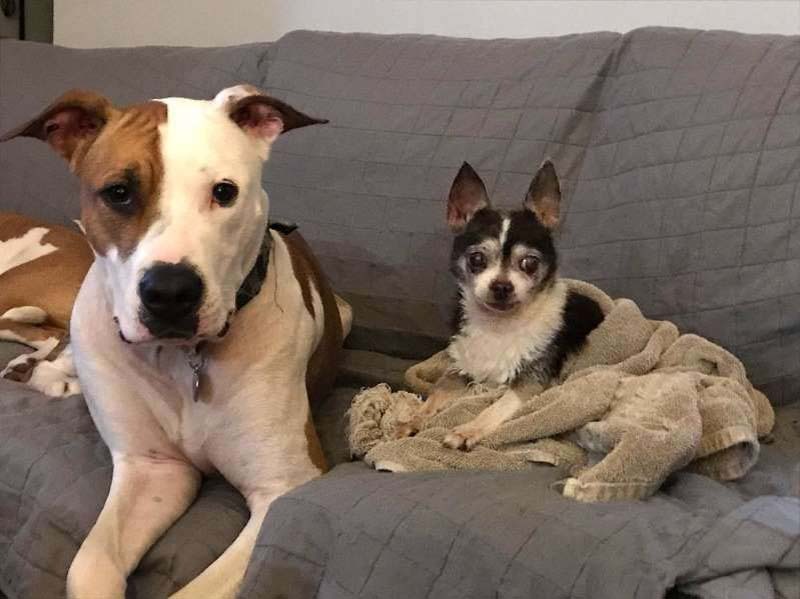 Frank often gets Helfer’s attention when Tito seems uncomfortable, and the Chihuahua looks after the pit bull by licking his large paws.